Ghana is celebrating 60 years of independence. There have been highs and lows in every facet, even in football. We look at 60 years of soccer in the West African side. Ghana is a country where football and boxing have largely dominated the scene. This is evident in the country’s Olympic medals haul and individual triumphs in games. Ghana are known to have a decent record at the youth level. Whilst they have been accused of age cheating, their credentials speak for itself. They played in 1989, 1995 and 2009 at the world stage but the 1991 tournament victory stands out. Odartey Lamptey, Sam Kuffour, Mohammed Gargo and the rest changed the scene after their title win. The 1978 Nations Cup victory on home soil is another special moment for Ghanaian football. They Black Stars were dominant in the 60’s but they slumped in form for years until the win. On the international club football scene, since the dominance of Asante Kotoko in the 70s and 80s, Ghana has struggled until Hearts of Oak changed their fortunes in the turn of the new millennium. They defeated Esperance in the African Club champions League, re-establishing the country as a football powerhouse in Africa at club level. On the flip side the game against Uruguay in the World Cup in 2010 – the first World Cup on African soil – is one that would never be forgotten. 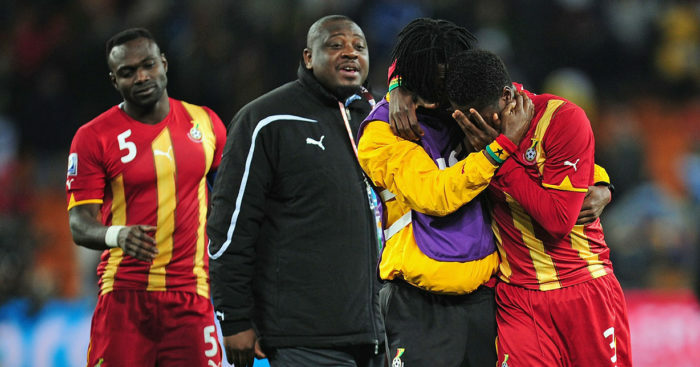 The players played their hearts out but the controversial foul by Luis Suarez on a goal-bound effort and the subsequent penalty miss by Asamoah Gyan meant they could not go on to break the jinx on African football. By all standards, the country has made several advancements in the game of football. They remain one of the top sides in African football anytime, anyday. Rugby Union, 2004 Six Nations Scotland vs France. Copyright © 2019 Damien Garot. Powered by WordPress. Theme: Ample by ThemeGrill.